This cheesy mix of chicken, salsa and mayo is scooped up in broken taco shells to make a tasty salad for one. Mix chicken, salsa, cheese and mayo. Break apart taco shells to scoop up salad. 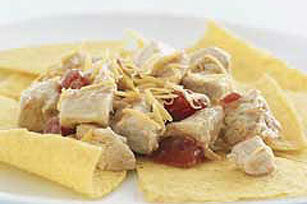 Or serve chicken mixture in taco shells. Enjoy with a serving of cooked black beans or brown rice and a side salad. For a veggie boost, top with shredded romaine lettuce and chopped tomatoes. Substitute 3 oz. (1/2 of 6-oz. pkg.) OSCAR MAYER CARVING BOARD Flame Grilled Chicken Breast Strips, chopped, for the chopped cooked fresh chicken.